Making your own minimalist tea strainer (easy to clean and it is cheap) | Save. Spend. Splurge. I checked in pretty much all the tea shops for a tea strainer that was NOT made in China. All of the tea strainers at David’s Tea and Teavana are made in China under “strict quality checks”. Read: Can you trust anything made in China? Then I found one made in Switzerland, sold at Degrees Kitchen in Toronto, and it cost $40. OUCH! I may buy this one for work because it’s handy, but I am not too keen on the fact that it has plastic in it. NOTE: Let the tea leaves mingle! For the best kind of tea, you need to let the leaves float around freely. Any kind of tea accessory like this tea ball that cams the tea leaves together and don’t let them circulate, are just choking the flavour and holding them back from socializing with the other tea leaves. This makes them unhappy, and they don’t release enough flavour. Anyway, I’m cheap enough to try and find a more minimalist solution and I found it in a cheesecloth! 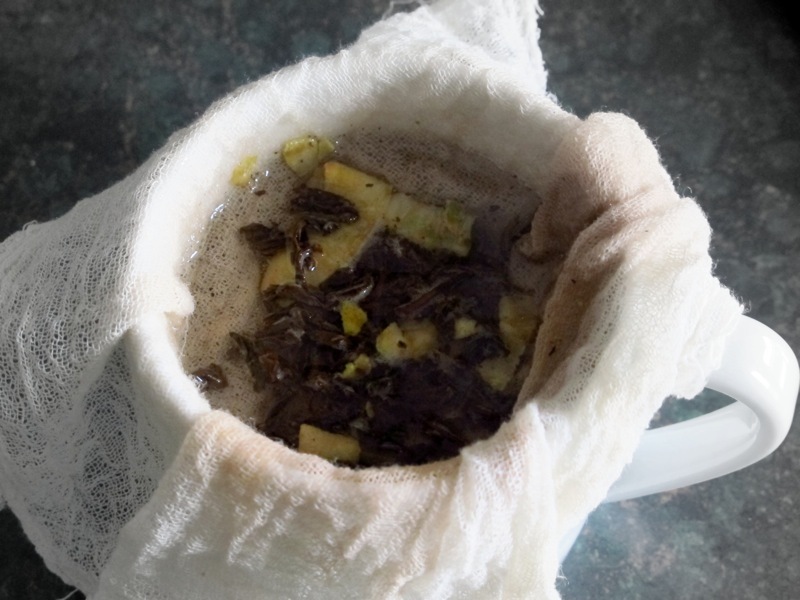 You need to have the tea free-floating and loose in the cheesecloth so that the flavour goes everywhere and seeps nicely. 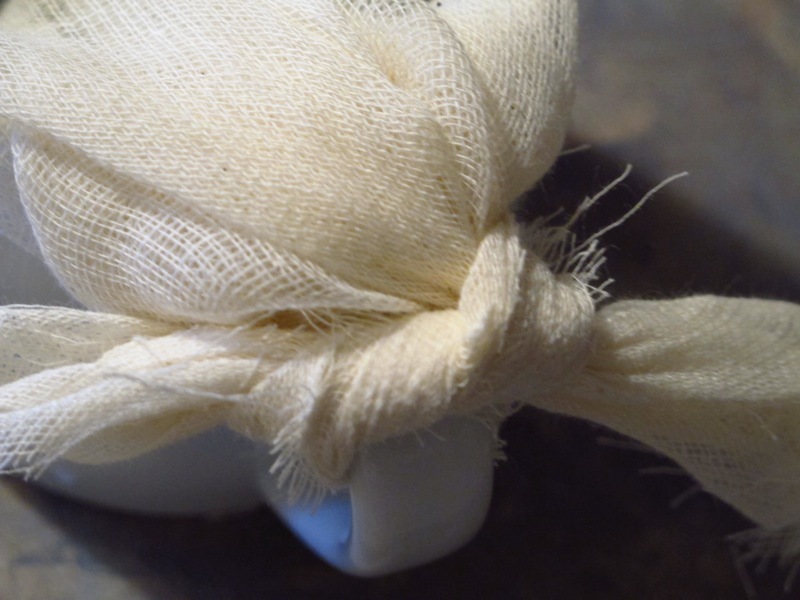 You can also decide to tie it into a knot onto the handle of your mug, but if you take a square piece of cheesecloth that is a good size, you don’t need to tie it at all (it’s hard to undo the knot when it’s wet). Sometimes it’s hard to let it steep properly, so I use a spoon to push down the cheesecloth down into the cup. I never worry about the little black bits floating around. I know it’s not going to harm me, they’re just loose leaf tea bits that made it through the cheesecloth. 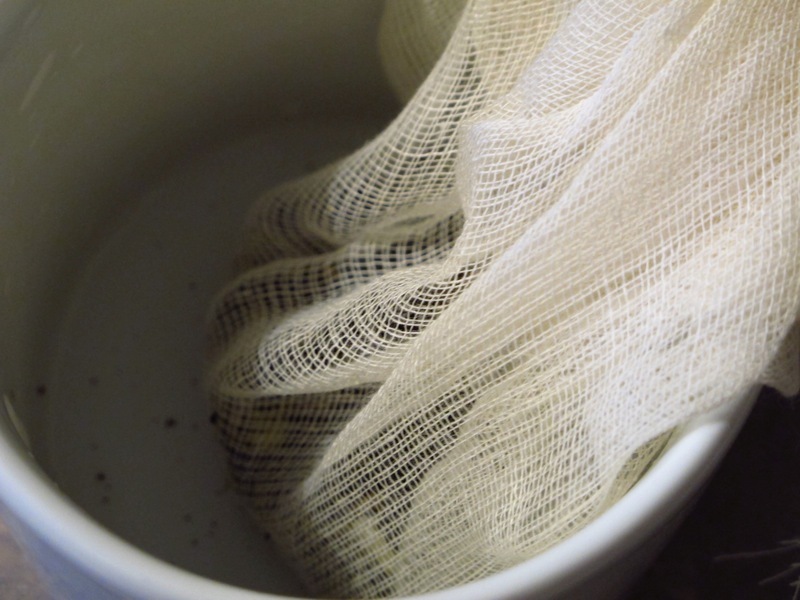 You can also use the cheesecloth to squeeze all the flavour out of the leaves, and then just open it to drop the leaves into your compost easily. I bought a cheesecloth at Williams-Sonoma for about $7. I cut up a big square from it, gave it a wash, and I was good to go. I have about a good 9 more squares I can cut from that W-S cheesecloth (a lifetime’s worth! ), which brings my total cost per tea infuser made to $0.77 each. A lot cheaper than $2.50 to $20 for a tea strainer or infuser, don’t you think? I can also use that American-made cheesecloth for other things, and it’s reusable (and easily washed) until it falls apart. If you really love drinking tea like I do, I cannot recommend loose leaf tea enough. Each teabag contains a staple, a string, and a small pouch filled with the tea — quite wasteful if you think about it; not easily reusable. Even if you can compost the tea inside and even the bag that comes with it, the staple and string still have to be considered and disposed of. The tea inside is not easily seen, and when you open it, it looks like random tea bits, some of it being branches, which is not where any tea flavour is from. Honestly, it reminds me of sawdust. Loose leaf tea is more expensive but for good reason. You get the actual leaves of the tea, not the sweepings off the floor stuffed into a teabag for sale after the looseleaf tea is bagged. Since you can see the tea, you know whether it’s just tea dust sweepings or real tea leaves. I mean really, how many cups of tea do you drink in a day? 1? 3? If you buy looseleaf tea, and if you decide to reuse the leaves (I don’t, I’m a prima donna tea-drinker like that), it is a luxurious cup of deliciousness 3 times a day that tastes like the real deal. You can also decide how strong you want your tea. Once I started drinking loose leaf, I never went back. Now when I drink bagged tea, I can taste the difference. It is not as strong, and it is rather watery and bland tasting. ← Investing Series: How and where do I get started to invest my retirement savings or money (Canada)? I am in the process of using up all my tea bags so I can switch over to loose leaf. Looseleaf is the way to go. I tried bags for years but found them lacking in flavour versus looseleaf. Also, tea bags are made from plastic these days. Even the expensive triangle shaped ones. Even though they say “Silk”? I neglected to mention that I cold brew in the fridge – but you don’t have to. Cold brewing is just no hot water touching the tea leaves. Very smooth tea but some actually like that “bite” of a little bitterness so it isn’t for everyone. I also, sometimes, cold brew coffee but tea is much easier and I’m lazy, so I usually just make coffee drip-style, but not tea, not ever. Tea is an easy cleanup but coffee is just a mess. Or I’M a mess, I don’t know which…ROFL! I will have to try that!! I cold brew and THEN heat. More tea per “non-bag” and no bitterness! What a great idea! I never would have thought of doing that. Thanks for the idea! Biiig tea-drinkers here, mostly loose-leaf like my grandad taught me. It is made in China 🙂 I checked. There are a few things I prefer to be made in Japan, one is tea implements and the other is mechanical pencils. Japan To You sells a stainless tea strainer with a wooden handle. I also have the Koizol Audrey Tea Flower which is made in Germany. I never thought to use cheesecloth, great idea. You have reminded about loose leaf tea. I used to drink mainly loose leaf when I lived on Oahu and had access to the great tea stores and Japanese grocery there. I’ve gotten lazy using bags and appreciate the reminder of how much I loved loose leaf (& also how much better it is for the environment). I just read about a book about a woman who got her family of four down to almost no waste. Part of it was she also bought many things from the bulk area of her health food store using her own containers and bringing her own reusable produce bags shopping also. Now I’m thinking about tea as well as those ideas. I am interested in this stainless tea strainer you speak of. I’ll have to look out for it because I am not excited about plastic. Cheesecloth is fantastic for a lot of things. I just think it’s the best for tea, and packs up easily. I bring my own tin to the stores now and ask them to fill it up with tea and charge me for it. I don’t want their plastic bags or their metal tins. Maybe not very minimalist but we use a teapot in our family. We put the leaves in the teapot whole and let it steep before pouring it for everyone (or just ourselves). Saves on the teabag and contraption thingee. I find the metal tea steeper things never work well either. I am the only one who drinks tea. Otherwise if I am sharing (which is never because no one wants a pot) we have a teapot that we use. I was even seriously considering the Breville Tea Brewer until I saw its construction in person and how heavy/bulky it was. I do the same thing but I think this is the asian thing to do. I don’t mind letting the leaves settle in the bottom of my cup and just not drinking the very last drop.